One of my first encounters with salmon was as a Fisheries Officer in Hampshire in the early 1990s rescuing a thirty pound salmon from a dead-end river channel in Romsey on the River Test, which was a favourite haunt of poachers. It was a magnificent fish, full of vigour and beauty and when returned gently to the river upstream it held still for a moment and then flicked its powerful tail and was gone. This was an exceptional fish. Salmon are one of the natural wonders of the world, making a truly epic journey of thousands of kilometres to grow and return to their home rivers to produce the next generation. However our latest assessment of the status of salmon stocks in 2014 shows that salmon are struggling in the face of manmade pressures across the north Atlantic. In England in 2014 the declared rod catch of 7,598 was the lowest on record and only 11 of England’s 42 principal salmon rivers met their conservation limit. While the 2014 report shows a continued decline, we are taking action to protect this iconic species by continuing to improve England’s rivers and estuaries. The biggest single factor impacting on the status of salmon populations is declining marine survival, which has nearly halved over the last 20 years. Through working with NASCO (North Atlantic Salmon Conservation Organisation) and the European Union we have secured agreement to restrict distant water fisheries off the Faroe Islands and Greenland. NASCO have also committed to a major new research programme to better understand the issues facing salmon at sea – SALSEA-Track. To give England’s salmon populations greater resilience in the face of declining marine survival, we are working with partners to maximise the output of healthy smolts from our rivers. Reducing exploitation by nets and rods is the most direct way to increase the numbers of spawning salmon. On the Solway Firth and the Severn Estuary we have recently restricted the number of salmon that netsmen can take, and we are currently reviewing regulatory provisions on the North East salmon net fishery, Teign, Dart, Eden and Anglian coast fisheries. With partners, we are actively encouraging anglers to increase the level of catch and release and we are clamping down on illegal fishing through joint patrols with IFCAs (Inshore Fisheries Conservation Authorities) and the police. To secure sufficient flows so that salmon can successfully access spawning habitat and to support juvenile recruitment, we have removed or reduced 61 unsustainable licensed water abstractions on salmon rivers since 2008 saving 20 million cubic metres of water per year. 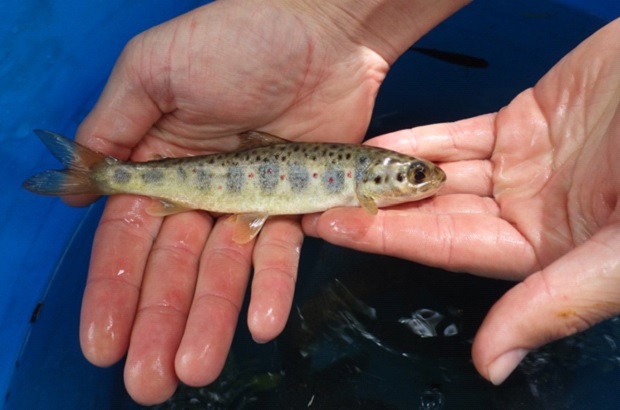 To maximise spawning success we have secured over 200 water quality improvements, investigations and catchment schemes on England’s main salmon rivers through the Water Companies’ National Environment Programme 2015-2021. To tackle diffuse pollution we are working with the Rivers Trust and Natural England to target agri-environment programmes. To improve access to good spawning habitat we are removing barriers to migration and enhancing habitat. Since 2009 we and our partners have constructed 63 fish passes on England’s main salmon rivers which has opened up 3,700 kilometres of river, and this is producing results. On the River Dearne in Yorkshire salmon have been recently found for the first time in 150 years following the construction of a fish pass at Sprotbrough Weir. And today salmon don’t get stuck in the dead-end channel at Romsey on the River Test, as the landowner, working with the Environment Agency, has built a fish pass to help salmon get upstream to their spawning grounds. We recognise that there is much more to be done and we will continue to work with our partners to safeguard England’s salmon populations.It is through working together that we can give salmon a much needed helping hand. You can download a copy of the 2014 Salmon stocks assessment from the CEFAS website from 16 July 2015. For more information about how our Fisheries and Environment Officers are working to improve freshwater habitat for salmon take a look at the Environment Agency Twitter feed. Sadly the important fist upstream fishpass on the river Aire at Chapel Haddlesey seems to be in doubt. Pity you can't sort the problems we have on the River Avon in Devon with inadeqate fish passes and hydro power schemes that are in breach of their conditions made by E.A. but E.A. still allow it to continue generating 2 years on.